Posted by santos. This entry was posted on 20051111 at 1:22 PM You can skip to the end and leave a response. hi reid--that's funny, i bought shunju at the same time. in fact, it was the book i was flipping through where i found the sesame asparagus recipe. i'll be doing another shunju recipe this weekend. Thanks for the recommendation, i'm going to pick up that cook book. I'm not eating much pasta either right now but that udon looks yummy. or pork scratchings. Lovely improv Santos. I just got that cookbook a couple weeks ago, too! I went to college with Eric. He is currently working on a new cookbook, which should be great. I just bought carrot juice today to try his rice recipe, and I can't WAIT to try the shoyu-brined turkey! Hey, I like your photo better than the one in the book! Thanks for all the kind words. ugh, that handsome bowl of udon is too much for me for to see at this late in the evening (23:20 my time). I don't like cilantro, but your pesto looks good nevertheless. hi joie! it was. 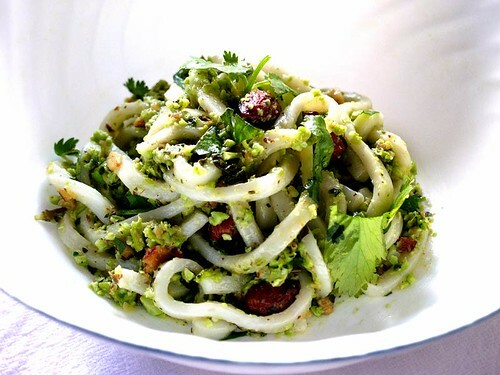 almost all the pasta recipes in the book use udon, so i'm happy, i think you will be as well. anthony--not so much improv as desperation in the face of an unorganized kitchen. hi chef! i don't know if you'll be back but just one question--i couldn't find any mention of ginger in the ingredients list of the marmalade bacon with meyer lemon and ginger recipe. is there really ginger in it? hallo miss chika! what are we doing on the internet on a very late saturday night?? i can't wait to see what you do from the bertinet book! this sounds dddddddericious santos! lovely! ah, saffron, if you were a cartoon character, what would you look like now that i know how you'd sound? foodnerd! if i didn't already own this book, i would love the person who would give this to me for christmas. hi j--i really like this book. i see it as a good everyday meal thing. Aaah, I made this edamame pesto too and it's heavenly - just like J, I must dig out my book and try the recipes. I made mizuna pesto from the yoshuko book and that was heavenly too. hey this looks really good! thanks for the idea in this post - will hv to try to mimic it!